Auto workers and supporters from three countries rallied last week outside a charity gala at the Auto Show in Detroit. We’re demanding that General Motors reverse its decision to close five North American plants, and possibly more. And if GM refuses, we’re calling on local governments use eminent domain provisions and call for worker/community meetings to strategize about what is the best way to use the facilities for a possible Green New Deal. The news of the closings, which came, right after Thanksgiving, was the last thing auto workers were expecting. We were surprised because 2018 was an extremely profitable year for GM. The third quarter alone produced $2.5 billion in profits. CEO Mary Barra claims that GM must change its product lines in preparation for “a vision of a world with zero emissions.” But where are the products that match that vision? In fact, one of the plants slated for closure manufactures the Volt, a hybrid. Yet auto workers from the U.S. plants are to be transferred to plants that are running three shifts six or seven days a week producing trucks. These gas guzzlers are extremely profitable! The United Auto Workers represents workers at the four threatened U.S. plants. Unifor is the union at the threatened plant in Oshawa, Canada. While Jerry Dias, president of Unifor, announced he would like to unite with his sister union across the border, no common strategy has developed. Unifor has taken out full-page ads in U.S. and Canadian newspapers, but the UAW headquarters at Solidarity House has remained silent. Unifor has organized actions at the plant as well as big rallies, including two in Windsor, just across the river from the GM headquarters. At the January 11 rally, the UAW did not send one union official—let alone match the 11 buses Unifor sent—nor even a solidarity message to be read from the stage. With the UAW doing little, it was up to rank-and-file workers, retirees, and community activists. In December the Detroit chapter of Democratic Socialists of America held a showing of “Poletown Lives,” the story of how 18 blocks of a working-class community were leveled and handed over to GM to build the Detroit-Hamtramck plant in the early 1980s. This plant is one of the five slated to close. They invited a number of organizations, including Labor Notes and our rank-and-file group Autoworker Caravan, to co-sponsor the event. More than 200 people came out to see how the plant began with the city clearing the land under eminent domain and gifting to GM. Many remember the story of displacement, others were shocked that GM made the promise to hire 6,500 workers—a promise never kept. The panel discussion following the film included the activist filmmaker, a current auto worker, and Rep. Rashida Tlaib, recently elected to the U.S. Congress. Everyone wanted to know: what can we do to stop GM from closing the plant? Given GM’s broken promise, it seemed particularly appropriate to demand the land and facility back. So DSA and Autoworker Caravan wrote an open letter asking organizations and individuals to sign on to a new Coalition for a Green New Deal. 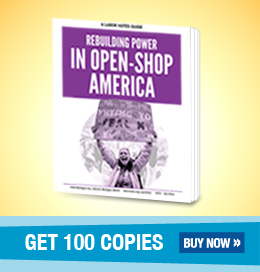 We outlined our first steps: demand that GM rescind its announcements and live up to its contract with the unions—but make it clear that if they don’t, we demand that city councils and other government bodies hold hearings with the workers and community to strategize about what products could be made to advance a green economy. Our first action was a demonstration at the January 18 charity gala held just before the opening of the International Auto Show in Detroit. Tickets are $400 each. Getting ready for the action, Autoworker Caravan put out its own leaflet, making the point that all auto workers must stand together. We are not willing to whipsaw one plant against another or agree to concessions in order to keep a plant going. We leafleted at the January 11 Unifor demonstration in Windsor and at local union meetings. Unifor Local 222 in Oshawa responded by sending a van with 16 workers and retirees, with union banners, flags and whistles, to the demonstration. We also had four Brazilian representatives from the GM plant in San Jose dos Campos (near Sao Paulo). Although no UAW official responded to the coalition letter, the International scheduled a candlelight vigil for the same day, just an hour before, and only a half a block from the coalition action. Members of Autoworker Caravan came to the vigil and passed out a “Stop Plant Closings" leaflet that invited them to the coalition demonstration just down the street. When the Canadian and Brazilian auto workers showed up with their banners, all eyes were turned to them! However, once the rally began, the chair spoke only of the four UAW plants that are to close. Some of us yelled out “Oshawa, Oshawa” hoping he’d mention them, but he only droned on. The UAW’s message at this candlelight vigil was: “Your plant may be closed, but you have transfer rights.” The temporary and contract workers in the plants also pay UAW dues, but have very weak transfer rights, if any at all. Of course this does not apply to the Unifor workers, who have no GM plants to transfer to. As the UAW vigil came to a close, a coalition contingent marched past, chanting to keep the plants open. Some of the 150 vigilers joined us as we flowed down the street accompanied by a marching band and signs. The press reported we turned out more than 300 demonstrators, who had fun dancing and singing in the streets. Over the course of our two-hour march and impromptu street rallies, we were able to get up close and personal with those attending the gala. At one point the Light Brigade stood on one side of the street, spelling out in lights “Green Jobs Now,” while demonstrators with our signs lined the other side, singing “Which Side Are You On?” as couples walked from the hotel to the hall in their tuxedos and long gowns. Congresswoman Tlaib and members from the Poletown, Warren, Oshawa, and Brazilian plants spoke at the rally or in the afterglow at a nearby pub. So did several representatives of environmental and community organizations. Probably auto workers and retirees made up about a quarter of the crowd, on the cold but windless night. But there wasn’t a core of auto workers from the plants that are closing. The UAW has told them that they have to be making individual decisions about what they and their families will do. In fact, by the middle of February, as two of the four lines in the GM Detroit-Hamtramck plant shut down, one-third of the workforce will transfer. Most will go to Flint Assembly, a truck plant working six days a week. Perhaps the UAW believes that, with contract negotiations opening this summer, it is possible to save the two assembly plants being idled. (The other two are transmission plants.) But this calculation doesn’t take seriously GM’s announcement about concentrating on research for autonomous vehicles. The reality is that the auto industry is undergoing a massive restructuring as it moves into autonomous and fully electric vehicles. This restructuring is still in the research and development stage, with production possibly a couple of years down the road. Even a militant mobilization isn’t enough to respond to that restructuring. Instead workers and their communities need a strategy that demands a green restructuring, where decision-making is based on what is useful to society, not what’s most profitable. Sam Gindin, former research director of the Canadian Auto Workers, wrote an interesting article last month arguing for taking public control of the Oshawa plant and undertaking a large-scale conversion to green production. This month a business writer for the Toronto Star called attention to Gindin’s proposal, pointing to the need to think big in times of crisis. I’d argue that what is needed is to turn these plants into worker/community co-ops, where at least several plants could be devoted to building the mass transit system needed in North America. Here in Motor City, one-third of the population doesn’t have access to a car and we have an inadequate bus system. With many U.S. cities replacing their bus fleets with electric buses, manufacturing electric buses is a natural! Next up for the coalition is to prepare city councils to call meetings and strategize about out next steps. The Autoworker Caravan is also organizing meetings and rallies to commemorate the 1937 victory of the Flint sitdown strike—making the point that the struggle today is similar to the struggle that founded the union. Dianne Feeley is a retired auto worker.